Tempris service and support team offers you a variety of services such as calibration and maintenance to ensure your temperature measuring system is running at its best performance and provides you with the most accurate data possible. Correct measurement is key in our technologized world. Incorrect measurements as a result, may have expensive consequenses. Measuring devices age because of mechanical, chemical or thermal stress and most certainly provide changing results over time. Even though this cannot be avoided, it is possible to recognize this rather early through regular calibration and maintenance. In order to sustain highly accurate product temperature measurements, there is an ongoing need of sensor calibration on an annual basis. Avail of our calibration and maintanance services for your Tempris temperature measuring system to avoid inaccurate data and to minimize batch failure risks. Regular checks for your measuring devices are mandatory according to almost all regulation and quality standards. 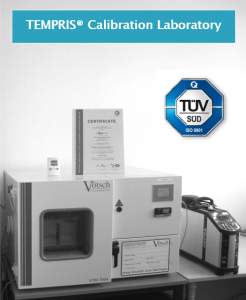 Therefore, for each calibrated device you will receive a calibration certificate according to ISO 9001:2015. In combination with a service contract customized to your specific needs – we offer local sensor and system calibration services in Central Europe and in United States of America. Our service technicians are trained to calibrate and service your equipment to the highest standards. Our software control processes make the most important service steps safer and more consistent. This ensures uniform quality regardless where the service is performed. Despite having sensors, which are highly adaptable to different conditions and applications, we have experienced that some applications can be very unique. We enjoy working close with our customers in order to find perfect solutions for their specific applications and requirements. Customize your service & support contract to suit your working environment and your needs. Please use the Tempris Service Request form if you require some support or service for your Tempris system.